With the tasty Cookie Fudge Crunch and even more amusing Vanilla Honey Granola having been tested, it's time to move on to the curious case of Mr. Toasted Almond. I only say curious because almonds just don't get a lot of love in the ice cream community. Sure, they get added in now and then, and occasionally someone like Breyers or H-D makes an almond flavored ice cream, but peanuts sees 10x the action that almonds do. Sure, technically it could be a cost issue, but I'm guessing it's a flavor issue and when you only have 6 flavors to offer, why risk one of them on almonds? I'll tell you why. If I served you a bowl of this Butter Almond Frozen yogurt and didn't tell you what it was, I bet most of us would never know it was frozen yogurt. The fat from the the almonds must bulk up this treat because I was totally fooled on this one - bravo Pierre's. At no point did I think I was eating yogurt. Not the flavor, not the texture, not the aftertaste, just a nice creamy (not chewy) treat ...totally fooled I tell ya. Now, to be fair, I will admit something: I was a little thrown off on my first bite. I didn't know what to expect and when it hit my tongue, my first thought was "yuck! ", but I gave it a second. And then I had a few more scoops. And then it was all gone. We are talking a somewhat mild flavor here that totally grows on you with every bite. The almonds are whole, and there are a decent amount of them - I seemed to get at least one a bite, but at the same time, I don't think I ever got more than two in a bite. I don't mind almonds, I'm really a peanut guy, but this one totally grew on me. I had to resist the urge to have another bowl. It's been two hours and I'm sitting here still impressed with this one. This is one of those proverbial "check the label" moments to make sure you are actually getting a bowl of frozen probiotic yogurt. Great job on this one, crunchy really has met creamy. 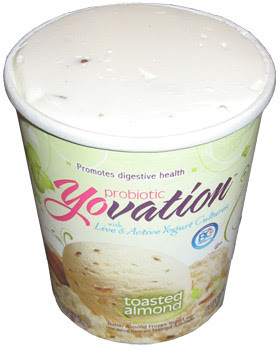 On Second Scoop: It takes a few bites to really get into it, but once you do, man, there's jsut about this one that I'm really digging. Maybe its the probiotics or the whole almonds, but deep down I think it's just different: I still can't tell I'm eating yogurt.